The Chicago Slices Teacher Cohort met for their final professional development workshop at the Chicago History Museum. 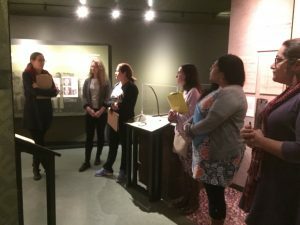 Teachers received a tour of the museum and were able to gather ideas of how the museum’s exhibitions can be used for their lesson plans. After walking around the museum, the teachers came back to the classroom to learn about all the amazing online resources the museum has available for teachers and the public. With all the great resources from partners, the teachers were ready to create their lesson plans. We are very excited for the ideas they came up with. Gloria is working on housing issues in the Back of the Yards neighborhood. 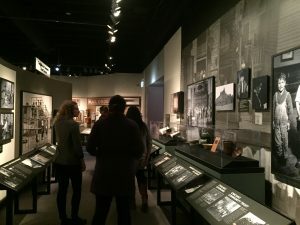 At the Chicago History Museum, she was able to learn about the Hull House and hear from residents of Chicago about changes in their own neighborhood. Kristina is interested in having a discussion with her students about immigration. The LAMP was able to provide her with some great resources that they used for their immigration PD in NYC. Dora is working on a lesson to have her students create work about legends. Mediaburn provided her with some videos about la llorona and the Nicaraguan folk singing group, Camayoc. With additional support from Hive Chicago and the Chicago Community Trust, the teachers will be able to receive funding for any equipment needs or field trip transportation. We look forward to sharing out their lesson plans when they are ready!